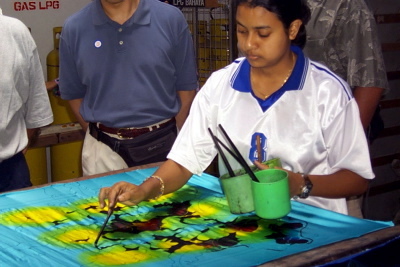 Batik is a technique for decorating textiles, by which parts of the textile that are not to be coloured are covered in molten wax. The wax prevents the textile from absorbing the dye during the decorating process. Wax resist dyeing technique in fabric is an ancient art form. Discoveries show it already existed in Egypt in the 4th century BCE, where it was used to wrap mummies; linen was soaked in wax, and scratched using a sharp tool. In Asia, the technique was practiced in China during the T'ang dynasty (618-907 CE), and in India and Japan during the Nara period (645-794 CE). In Africa it was originally practiced by the Yoruba tribe in Nigeria, Soninke and Wolof in Senegal. Since the 16th century the art of batik has been documented in the Malay Archipelago, and particularly in Java the art was developed to a very high standard. The legend goes when Laksamana Hang Nadim was ordered by the Malacca King, Sultan Mahmud, to sail to India to buy 140 pieces of serasah cloth (batik) with 40 types of flowers depicted on each. 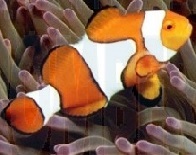 Unable to find any that fulfilled the requirements explained to him, he made up his own. On his return unfortunately, his ship sank and he only managed to bring four pieces, earning displeasure from the Sultan. Paraffin wax, yellow as well as white, is brittle and cracks easily so that the dye penetrates to the textile and creates a marbled look. Resin binds the ingredients together and makes the wax cling better to the textile. Animal or vegetable fat adds flexibility to the wax mixture. Often wax mixtures are used again. Malaysian Batik is batik textile art of Malaysia existing in almost all states in Malaysia. 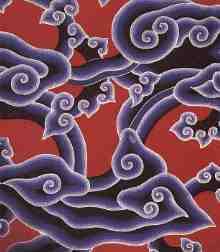 The most popular motifs used by batik artists include leaves, flowers and abstracts. Malaysian batik is mostly large floral motifs, light and vibrant in colouring. Malaysian batik depicting humans or animals are rare because Islamic practices forbid animal images and other pictures which are against sharia as decoration. The Malaysian batik is also famous for its geometrical designs such as spirals. 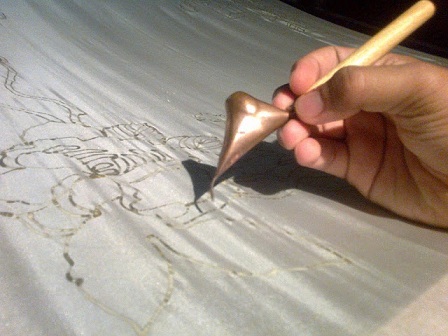 The method of Malaysian batik making is also quite different from those of Indonesian batik. For men, Batik can be worn at dinner functions. Even the ladies wear the fabric as formal dress, combining batik with modern fashion. The Malaysian government encourages civil servants to wear batik every Thursday of the week. Souvenirs of Batik are very popular. If you don't have a tie and a shirt with long sleeves, you may enter for example the casino in Genting Highlands within. With a (borrowed) Batik shirt it's no problem!